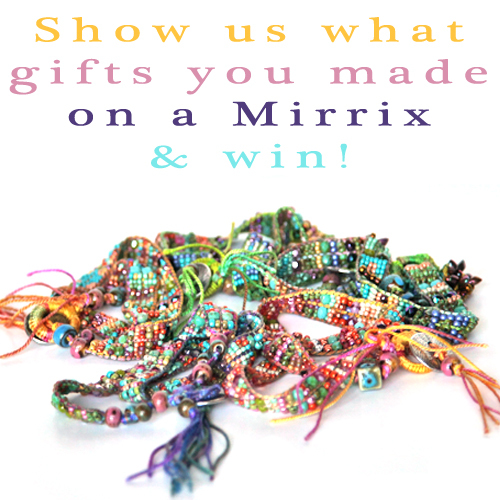 Win a 5″ Mini Mirrix and Share The Love! The holiday season is upon us and we want to make one person’s holiday just a little bit brighter! We are giving away a totally free Mini Mirrix 5″ Loom* (or the price of a Mini applied to any other loom) to one lucky winner (whether you’re a wannabe Mirrix owner or already have one in every size) on January 1st, 2013! One runner up will get $50 towards the purchase of a loom and a second-runner-up will get their choice of any three Mirrix bead patterns. How do you qualify to win? All you have to do is tell us why YOU want a Mirrix! 1.) Write a paragraph telling us why you want a Mirrix Loom. What have you heard or experienced about our looms that makes you want one? What would you use it for? What is your favorite feature on a Mirrix Loom? Are you already a Mirrix owner or is this your first one? Be creative and share the love! 2.) Make sure you are signed up for Mirrix’s Newsletter The Weekly Weave http://www.mirrixlooms.com/newsletter.html. We’ll post all answers to our website and allow users to vote for their favorite answer. You can see that page (and vote!) here. We will contact the winner on January 1st, 2013! Email elena@mirrixlooms.com with your paragraph (described above) telling us why YOU want a Mirrix and including your name and contact information. Make sure you put “MINI MIRRIX CONTEST” in the subject line of your email. Then, make sure you are signed up for Mirrix’s Newsletter The Weekly Weave http://www.mirrixlooms.com/newsletter.html. Those not signed up will not be eligible to have their paragraphs posted. DO NOT POST YOUR ENTRY IN THE COMMENTS. All entries must be emailed. Companies and magazines can share-sponsor this contest by posting to their blog, email list or website about this contest. Sponsors will get their logo and a link back to their website or blog on this contest page. Email us elena@mirrixlooms.com if you are interested in being a sponsor! 3. In the case of a tie, Mirrix President Claudia Chase will decide the winner. 4. Entry Restrictions. Limit one (1) entry per person. All entires of people who have not joined the Mirrix Mailing List will not be posted. Each person voting can only vote once. Suspicious votes WILL be deleted based on an analysis of IP address and time of vote. 6. 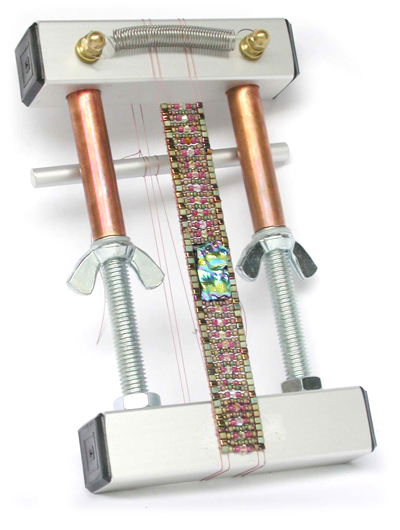 By entering this contest, participants agree that their paragraph about why they want a Mirrix Loom will be posted publicly on the Mirrix Tapestry & Bead Looms blog.